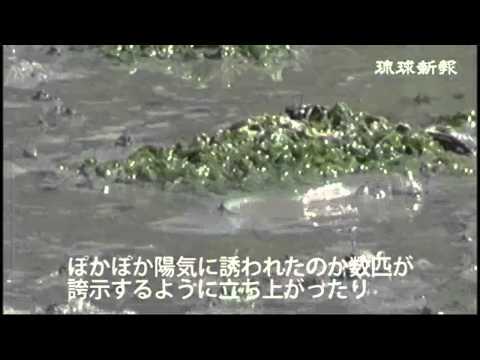 On March 7 courtship displays by rare bearded mudskippers (tokagehaze or Scartelaos histophorus) were seen on the tidal flats in Fusozaki, Nanjo. 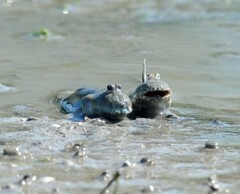 Because the temperature was relatively high, the mudskippers stand up to attract each other before cuddling up with their partners. The timing is early this year, with this behavior normally witnessed around the end of March into April. The bearded mudskipper or tokagehaze in Japanese is an endangered species listed in the Red Book of the Ministry of the Environment. It is unique to Okinawa, where Fusozaki and Nakagusuku Bay provide the largest area of habitat. It is 15 centimeters long and has a mast-like long dorsal fin. A high-pressure system moving up from the south pushed the temperature high on March 6. A record high of 28.4 degrees celsius was recorded on Hateruma Island.